Owning a solar powered car is well and good considering the eco friendly aspects but what is really needed are solar charging stations. In order to EVs to be truly viable, sufficient recharging areas need to be set up. The lack of stations is one of the main reasons consumers aren’t too keen on investing in an EV. Over the years, companies have developed different kinds of stations but the one manufacturer that has taken them to the next level is Pvilion. 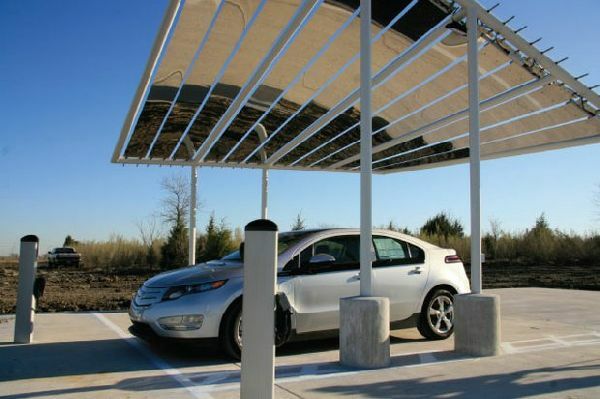 The New York-based company has developed its first ever Solar Sail electric car charging station using UNI-SOLAR photovoltaic laminates. The installation cost an estimated $85,000. Pvilion’s solar station is located in Pflugerville, Texas. What is unique is that the design allows the stations to be customized and built as per the location’s specifications. Pvilion uses a lightweight material named UNI-SOLAR which is only about 1/8th of an inch thick. The flexible laminates of UNI-SOLAR are attached to stainless steel sheets which are tensioned and twirled in order to create the Solar Sail. The station is set up to face south and packs a massive 1,600 watts with each of the individual UNI-SOLAR panels positioned at separate angles to optimize the amount of energy produced. The power produced from Solar Sail is enough to charge two EVs on a daily basis. Since the station is connected to the grid, unused electricity gets fed back into it. The Solar Sail also incorporates integrated LED RGB lightings which makes it visually appealing. Pvilion also manufactures mobile solar panels which can be attuned for varying solar captures used in homes and commercial buildings. The company, which was founded only a year back, appears to be making waves with its initiatives and will look to set up more such stations in the near future.